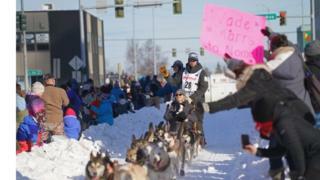 Crowds gathered in the Alaskan city of Anchorage on Saturday to celebrate the ceremonial start of the 47th Iditarod Trail Sled Dog race. 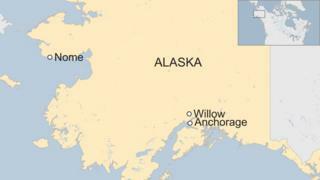 Teams of dogs led by drivers known as mushers dashed across the snowy streets in preparation for the 1,000 mile (1,600km) race from Willow, a small community north of Anchorage, to Nome on Alaska's western coast. 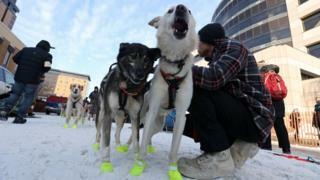 Starting on Sunday, 52 dog teams will take part in the race, crossing two mountain ranges, the frozen Yukon River and ocean ice on the Bering Sea Coast. The competition has faced controversy in recent years following a dog doping scandal, with several big name sponsors pulling out. 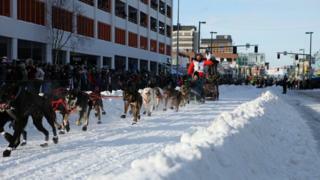 Mushers start with a team of 16 dogs, a mix of breeds known collectively as Alaskan Huskies, but the rules state that only five must remain as they cross the finish line in Nome. Those who get injured or fall ill along the way are dropped off at designated stops, where they are cared for and flown to Nome where the musher collects them. According to People for the Ethical Treatment of Animals (PETA), more than 150 dogs have died in the race, including one last year and five in 2017. Snow was transported in on trucks to fully cover the streets of Anchorage in preparation for the ceremonial event. 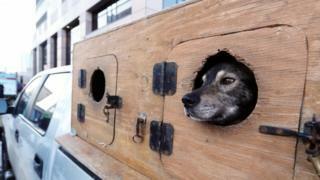 Last year's, Norway's Joar Leifseth Ulsom, completed the Iditarod Sled Dog Race in 9 days and 12 hours and took home the winner's prize of $50,000 (£37,850). He was the first winner in seven years to not come from the American Seavey family. 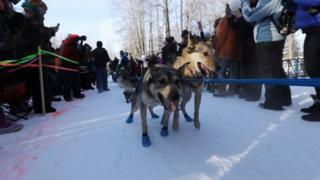 Between 2012-2018, either Mitch Seavey or his son Dallas took the title.